Thirty four years ago there was not a single tree, and no lawn, on the site where Donna Murphy’s new house was sitting. 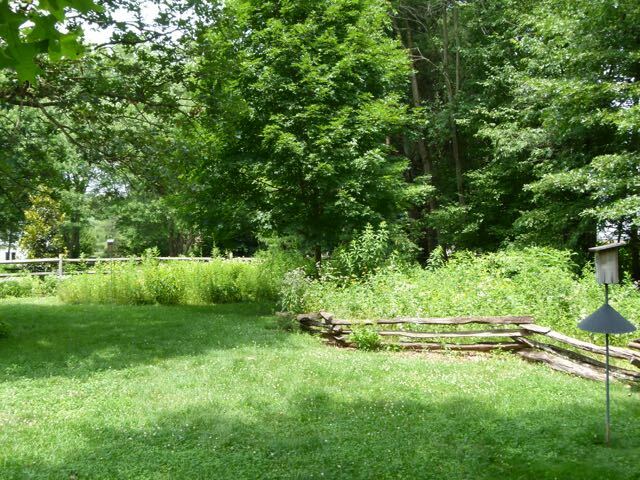 She knew very little about native plants at the time, and was planning on establishing a traditional lawn, with perhaps a vegetable garden for some fresh food and a good experience for her young son and daughter. The journey they embarked on after they moved in did not lead to achievement those goals, but has led her down a path of discovery that provided rich rewards of another kind. Donna and Mark preferred a more naturalistic style rather than formal one. They used hardscape features to bring a sense of order into the design. 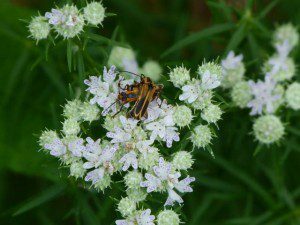 Narrow leaf mountain mint, proving its value as an insect attractor. When Mark joined the family about ten years later, he added his own set of skills to the enterprise. Today the Murphys’ house is surrounded with the leafy shade of a variety of native trees, and thick, abundant beds of native wildflowers. Native shrubs and vines occupy strategic spots in the landscape; the grand total is close to 100 species of native plants. No fertilizers or pesticides have been used in the fifteen years. 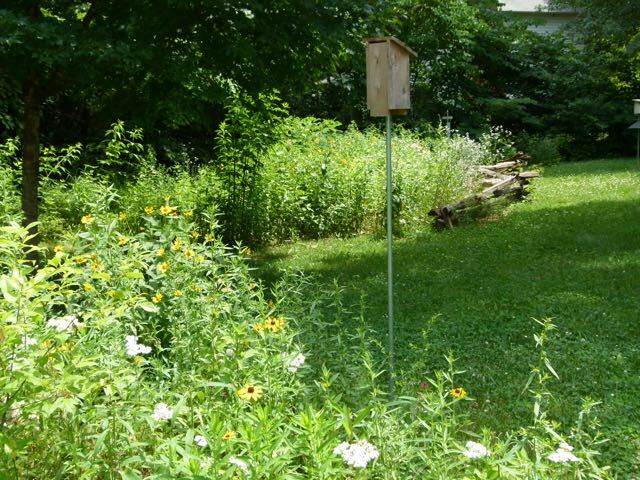 No one will be surprised to learn that the Murphys’ yard is replete with the added element of wildlife, including birds, butterflies, and pollinators of all sorts. The story of how this native landscape evolved is a testament to the combined efficacy of myriad local agencies, organizations, and people who understand that the welfare of the environment is not an optional choice but a critical commitment individuals must embrace. For Donna it began with a talk by Ed Risse, who was employed at the time by the folks who developed Franklin Farm, where the new house lived. Ed gave a talk to the new residents about the value of the forest on the open space that had been preserved by the developer, about 180 acres, a portion of which had native trees. Ed’s advice to the residents on how to care for the open space was very simply to refrain from mowing and just let what was there come to fruition. “Virginia likes to grow trees,” he said. Donna took that advice to heart for her own yard and the tree adventure began. The back portion of the lot, undisturbed because the builder was not required to put grass seed there, became the no-mow zone. Donna dug up and transplanted some tree seedlings from undeveloped land across the street. Those turned out to be black cherries, (Prunus serotina). A tree grew right next to the foundation of the house; Donna carefully transplanted it to the back yard. It turned out to be a tulip poplar, (Liriodendron tulipifera), now over 100 feet tall in the center of her thirty year-old woodlot. Hackberry, (Celtis occidentalis), box elder, (Acer negundo), and southern arrowwod, (Viburnum dentatum), all turned up on their own. Donna kept these, and by then knew enough to discourage some of the other things that came in looking for a home, like multiflora rose, (Rosa multiflora). The fenced portion stops where a path leads into what has now become a forest. Donna keeps a small potting area tucked away back there, in addition to a compost bin. Striving to know the plants that would be beneficial, Donna was struck by the irony of what she was hearing when her children were sharing their lessons from school. The people who preceded us here knew a lot more about their environment than we seem to. Knowledge of plants, and their uses, where to find them, and favorable conditions for growing them used to be an integral part of the common experience. Bee balm, (Monarda fistulosa) is part of the merry mix. Spring through fall, there is always something blooming! Her interest in native plants grew as Donna continued to seek knowledge about the natural world from the Master Naturalists, from Marion Lobstein, from field trips with the Virginia Native Plant Society. When the vegetable garden turned out to need too much watering, in place of vegetables Donna threw out a packet of mixed seeds from Huntley Meadows. Up sprang the oxeye, (Heliopsis helianthoides), bee balm, (Monarda fistulosa), and coneflowers, (Echinaceae spp). From the Audubon Society’s Ambassador at Home program came Maryland senna, (Senna marilandica). From Meadowlark Garden, where she was volunteering, Donna brought home a few hairy sunflowers, (Helianthus hirsutus), which spread like wildfire, and some short toothed mountain mint, (Pycnanthemum muticum). From the VNPS Potowmack chapter’s propagation bed, where Donna is a regular volunteer, she was given obedient plant, (Physostegia virginiana), and the three Rudbeckias; hirta, fulgida, and triloba. Seeds from foxglove beardtongue, (Penstemon digitalis) and golden alexander, (Zizia aurea) hitched a ride home on her pants and were happy to plant themselves. A wide variety of textures as well bloom times gives the landscape continual interest. It feels like a cooperative effort between Mother Nature and me. The plants that like the conditions they’re in know who they are, and they let me know! And the ones that migrate have another way of showing me what they like! Trellises covered in coral honeysuckle, (Lonicera sempervirens), just coming into bloom in early spring, provide a screen for privacy on the back patio, but don’t stop the view leading into the back. Over time, Donna grew the beds, by now forming natural plant communities, and shrank the lawn. To give structure and a sense of order to her exuberant wildlfowers, Donna added several hardscape features. 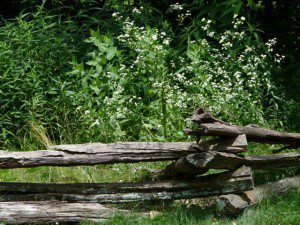 One of these is a low, natural-looking wooden rail fence, serving to divide the low-growing freedom lawn from the border surrounding it. Trellises covered with coral honeysuckle, (Lonicera sempervirens) provide a privacy screen for the back patio. Donna has recently begun to experiment with mixed grouping of plantings in containers, and these make perfect accents that can moved where they are needed. 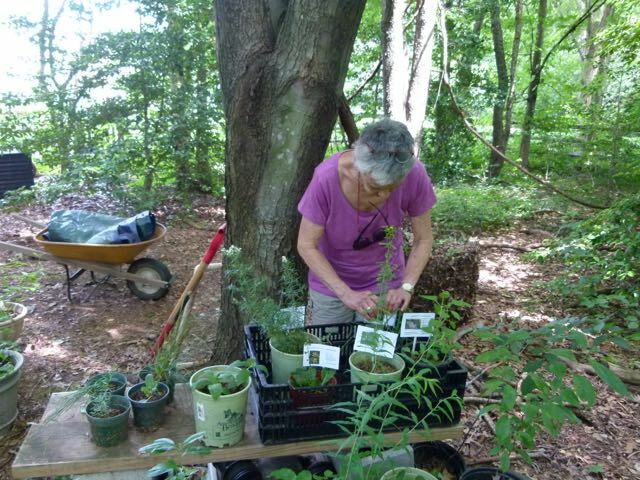 Donna’s dedication to learning about native plants, and to supporting environmentally friendly practices has returned good value on her investment. Her yard is a not only a chemical-free refuge for people and wildlife, but also a place of great beauty and tranquility. And good news! 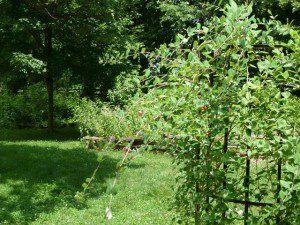 You will be able to visit the Murphys’ yard next spring on the Northern Virginia Soils and Water Conservation District’s 2016 Watershed Friendly/Sustainable Gardens Tour. Don’t miss it! Donna in her potting area, placing labels on plants to be used in a demonstration. 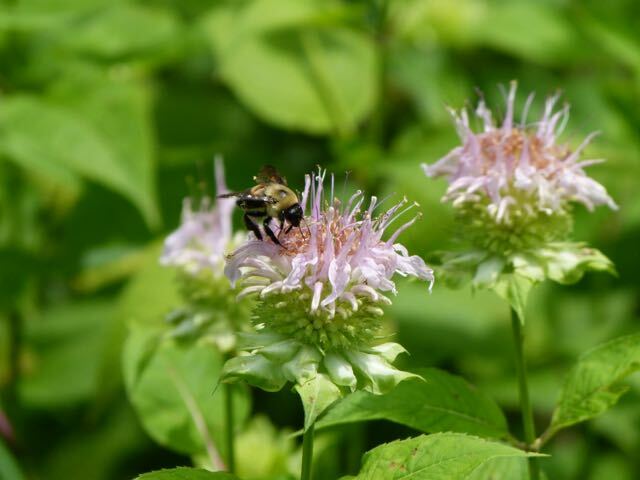 Superb article about one of the best ways to move forward with ecological sustainability… My hat is off to Donna and Mark Murphy and the Virginia Native Plant Society! Wow …this is fabulous! I started going native in my own yard (since May) and I’ve already noticed an increase in bees, butterflies and birds. This will be the first year I haven’t raked the leaves to the curb for pickup…I’ve dragged them all to the backyard to create more beds in the spring! Thankfully, I’ve never used commercial fertilizer because I couldn’t afford it. Can’t wait for spring to see how everything fares! 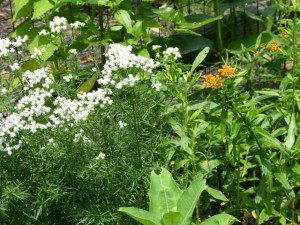 We live in an 1842 home and have tried to keep the perennial garden planted with period plants.